NCD Alliance - "A Healthy Future for All: Investing in Early Years for NCDs and Post-2015" September 21 - 6:30-8:00pm at the Westin Grand Central Hotel, 212 East 42nd Street, New York. Please click here for a save the date with more information. We hope that you will be able to join us for this high-level event. Please RSVP here. Reimagining Adolescent Health in the Developing World: Breaking New Ground, Finding Health Strategies that Work, Wednesday September 24, 2014. Read more or register. 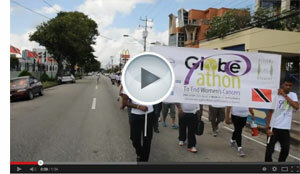 PAHO Women's Cancer Event - September 25 - A joint commitment to save lives. Read more. Please RSVP here. The New York Academy of Medicine UGNA Side Events - Urban Health for a sustainable future: The Post 2015 Agenda - 20th September 10am-1pm. Read more. Register here. Role of Civil society for Monitoring the Progress of SDGs after 2015 - 23rd September 4-7pm. Read more. Civil society has a central role to play in accelerating tobacco control action. If you are a civil society organisation in Trinidad & Tobago - we want your input. Tobacco use is the leading preventable agent of death in the world today and is responsible for more than six million deaths each year. Unless urgent action is taken to reverse this global epidemic, the World Health Organization expects that tobacco will kill as many as one billion people this century, taking a greater claim on human health than any single disease. Tobacco is the only legally available product which, when used as the manufacturer intends, kills half its users. 16 October 2014, 11am – 1pm Room A: PAHO Headquarters – Washington D.C., USA. This event is being hosted by the Director of PAHO/WHO, Dr. Carissa Etienne, to coincide with the launch of the Lancet Series on Universal Health Coverage in the Americas. The event will showcase the Special Series and in particular Latin America’s unique experience in moving towards Universal Health Coverage. It will be broadcast via the web here. As seating is limited, we request confirmation of your participation by 1 October 2014 by contacting: Katherine Ghimenti, UHC-LancetSeries-LA@paho.org, Tel: (1-202) 974-3342.